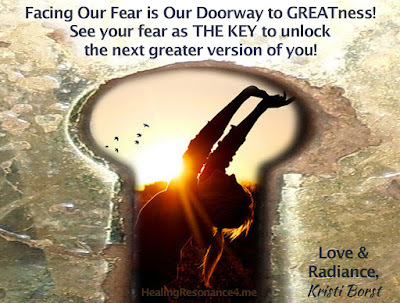 Healing Resonance Articles by Kristi Borst: Facing Our Fears Is the Doorway to Greatness! So many times we see our fears as limitation. I'm inviting you to look at them as empowerment! How can that be? Well, if you can excel at something you already have mastered, you're not really growing and stretching, are you? Sometimes we need to push or pull ourselves out of the space of comfort to realize that the place of comfort was not necessarily the space of joy. What if the next greater version of you is playing hide and seek with you being the mask of your fears? Think how many times that thing you so feared as a child (riding a bike with no training wheels, diving into a pool or pond, trying a new craft or skill) turned out to be something you really enjoyed or which empowered you! Personally, I can remember standing at the end of the dock for what seemed like 15 minutes those first few times of diving. It seemed like my head might break if I hit the water the wrong way ... but something finally gave me the courage to go. Perhaps it was the urging (or shaming) of those older than me. Yet, seeing them doing it was not enough to squelch my fears. Eventually, I had to reach deep within myself and find that space of trust and belief in ME! What if your fears are guiding you toward your True Self? The fears that you've been accepting as limitation may have been viewed from a limiting perspective. Just as our judgment of others can give us clues to what we are longing to be or longing to change about ourselves, our fears are, perhaps, a test from the Higher Self saying "let's see if I can get myself beyond this mirage." Truth is, you are only limited by the limitations you place on yourself. Take the time to assess the things that arouse fear within you. Where are their origins? I suspect for most of us, they are not grounded in this present physical time space. They are the fragment of some story that we were told and/or told ourself that is no longer even REAL! In the last month, I've had two separate clients comment that they either "did not listen to their fears" and pushed forward in making an appointment. The transformation in a single session was startling. I had another client call and say she "bit the bullet" and called me for help. Bravo! But asking for help is good. We are communal beings and need one another by design. If you cannot get from point A to point B on your own, find a healing partner or coach. Understand that I'm not saying we should never listen to our fears. Sometimes our fears are valid and are there to protect our physical vessel from harm. What I'm saying is we need to stand back an listen to our fears. We need to learn to distinguish when they are coming from a primal need for physical protection and when they are coming from another time/space reality. Consciousness = the Power of Choice & the Power of Change! Just as Dorothy always had the ability to "go home", you have the key to your happiness and expansion. It's about stripping away the things that are keeping you from feeling, sensing and embodying the light that is there, ever-ready to spring forth. It's less about doing, trying, seeking and more about BEing. Happy spring ... I look forward to seeing you bloom!